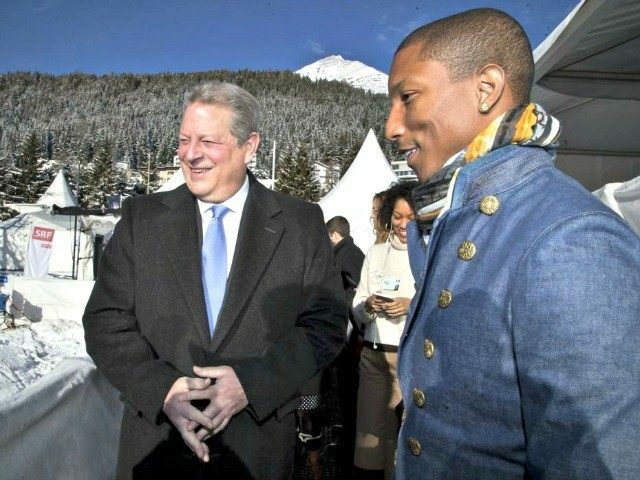 Al Gore and Pharrell Williams took to the stage at the Davos Economic Forum on Wednesday to announce the second iteration of Live Earth, a series of worldwide concerts to raise awareness of climate change. Gore and Williams were joined by Live Earth co-founder Kevin Wall to announce the concerts, which will take place across all seven continents on June 18, according to the Guardian. The event hopes to capture a global television audience of 2 billion across 193 television networks. Williams, who performed at the first round of Live Earth concerts in Rio de Janeiro in 2007, will reportedly serve as the event’s creative director. The first series of Live Earth concerts took place on July 7, 2011, with 150 artists, including Genesis, the Black Eyed Peas, Kanye West, and the Police, performing across 11 locations worldwide. The original event drew criticism from environmentalists at the time, who noted the irony in artists traveling tens of thousands of miles in pollution-spewing jets and buses. This year’s event reportedly hopes to feature 100 artists across the seven total concerts, with each concert running four to six hours long. The World Economic Forum, where the announcement was made, was similarly criticized for its carbon footprint this week; 1,700 private jets reportedly carried attendees from around the world to the event.